It’s less than 20 miles from border to border. It has two heads of state — one a bishop from Spain and the other the president of France — but its official language is Catalan. Its mountains rise higher than 9,000 feet, and they’re home to some 125 miles of ski slopes. This is Andorra, a tiny landlocked principality that’s nearly all vertical, tucked in the eastern Pyrenees between France and Spain. Historically, it occupied important trade routes through the mountains, and it continues those trading ways today with duty-free goods. But in the winter, cheap liquor, cigarettes and perfume take second billing to snow. Andorra’s mountains bring skiers from all over Europe and a handful from the U.S. A day on the lifts offers visitors the chance to practice French, Spanish, German, Catalan, Russian and other languages I couldn’t decipher. 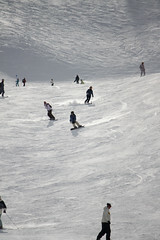 Best of all, skiing usually lasts well into spring, with many resorts open until April if snow conditions cooperate. From the U.S., traveling to Andorra usually means landing in either Barcelona, Spain, or Toulouse, France, and renting a car or taking a bus. It’s about 3 1/2 hours of driving from Barcelona through increasingly mountainous areas dotted with crumbling castles and soaring churches. Andorra has been a relatively inexpensive ski destination for Brits and other Europeans for years, but it wasn’t very user-friendly the first time I visited in 2003. My wife and I stayed in the capital Andorra la Vela and found it difficult to get to the slopes via bus. Everyone smoked and maps and tourist information were scant. On a trip this winter, we found it more geared to tourists. Now buses run frequently and are easy to catch, and tourist information is a bit more available — though smoking remains intense. Most of all, though, the ski amenities are far better. Faster lifts, one ticket for four linked ski areas and more snowmaking capacity means more time skiing and enjoying the Pyrenees. Pas de La Casa is the easternmost of the linked resorts, lying along the border with France. Unfortunately, the border is unmarked in the mountains, so I’m still not sure if I managed to ski into France. Locals say Pas de la Casa has the best reliability for snow. It was some nice intermediate runs as well as beginner areas. It’s very popular with the British, so English isn’t uncommon here. And the many bars and apres ski spots thrum with energy. My snowboarding friend and I preferred the area of Grau Roig — right next to Pas de la Casa. The crowds were slightly smaller and the terrain more varied. Many of the Andorran slopes are treeless, but Grau Roig has some nice runs where you can go off-piste among sparse woods. And there are some nice steep runs as well. We stayed in a condo near El Tarter, where a gondola takes you halfway up the mountain to a hub of activity. There are several restaurants, dog mushing, ski and snowboard school and lifts heading up to the top of the mountain. Throughout the Grandvalira circuit, there are igloo hotels and bars, snow go-karting, snowshoeing and even scuba diving under the ice in alpine lakes. After a long day on the mountain, Andorran restaurants seem to offer larger portions than I remember from most European trips. A good way to get a nice sampling of food is to order the menu of the day. Diners get a choice of first, second and sometimes third course, along with dessert at a set price. We were overwhelmed by the El Sola restaurant next to the Ice Palace (Palau de Gel) in the town of Canillo about 15 minutes down the main highway from El Tarter. A large open dining room gives a clear view of the chef cooking immense slabs of beef, lamb and pork at a giant wood fire. Just after we sat down, the owner dropped off a dish of grilled sausages. The warm goat cheese salad was a giant pile of fresh greens with a toasted block of goat cheese drizzled with honey. After a steak the size of Texas defeated my appetite, our request for the check instead drew a bottle of schnapps and another liqueur called Ruavieja. When we did get the check, the damage was only about $47 (35 euros) each, with a bottle of red wine. Fine dining isn’t the only relief from the ravages of mountain activities that no longer match my advancing years. Andorra has many spas. But, the biggest and most amazing for me is Caldea. It has a huge indoor-outdoor pool with bubbles and jets and other soothing treatments. Stairs lead out of the center of the pool to raised whirlpools under the high glass roof. Near the pool, a large hot pool and smaller ice-cold pool make up what’s called the Indo-Roman baths. Of course, there are dry saunas and a steam room, which has sparkling stars in the ceiling and the scent of eucalyptus. Sign up for a spa treatment and Caldea opens up a whole different level of fun and relaxation. The Pyrenees are neither as high as the Alps, nor as dramatic in appearance as the Dolomites. But between the food, shopping and spas, plus affordable prices and Barcelona as a jumping-off point for your trip, tiny Andorra with its European mix offers more than enough for a memorable ski vation. ANDORRA: http://www.andorra.ad/en-US/. Depending on snow conditions, skiing usually continues through early April. Buses are available daily from Barcelona, Spain, or Toulouse, France, to Andorra, about 3 1/2 hours travel time. 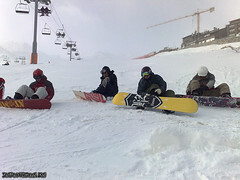 Ski information, including snow reports and ski pass purchase details, at http://www.skiandorra.ad/ (click on English). Caldea spa, http://www.caldea.com/en/. La granadina estación de esquí de Sierra Nevada es la preferida por los españoles, según el 24% de los encuestados por TripAdvisor, seguida por Baqueira Beret (Lérida), elegida por un 17%, y a más distancia, Formigal (Huesca), con un 6% de las preferencias. TripAdvisor reveló ayer los resultados de una encuentra sobre esquí, realizada entre cerca de 700 españoles, teniendo en cuenta que la temporada acaba de empezar y que la práctica de este deporte es un pasatiempo para uno de cada dos ciudadanos. Los españoles eligen, cuando deciden salir de España a esquiar, estaciones cercanas. Para el 23% de los encuestados, Pas de la Casa, en Andorra, es la estación favorita para el deporte alpino fuera del país, seguida en segundo lugar por la estación de Ordino Arcalís, también en Andorra, con un 10% y en tercer lugar St. Moritz (Suiza) con 9%. Asimismo, Sierra Nevada alcanzará hoy los 55 kilómetros de pistas, la mayor superficie esquiable de la temporada, gracias a la incorporación de nuevas pistas en la zona de Laguna de las Yeguas, según informó ayer Cetursa, empresa pública que gestiona este espacio invernal.